← How strong does a child’s connection to nature need to be for pro-nature behaviours? Why does a connection with (the rest of) nature improve well-being? Nature is good for our well-being. It is increasingly accepted that having nature nearby is important for human well-being. There are now Government policies on connecting people with nature for well-being, such as the United Kingdom’s 25 Year Environment Plan. This plan includes a ‘Natural Environment for Health and Well-being’ programme to promote nature for well-being. As well as simply having nature nearby, we now know that the relationship between people and the rest of nature, our nature connectedness, is important. Recent evidence suggests that connection with nature is more important for mental well-being than simple exposure to nature. However, we don’t understand how a connection with nature leads to improved mental well-being. Research based on the successful Wildlife Trust’s 30 Days Wild campaign has just been published that starts to tell that story. You can read the full article in the journal Frontiers. This blog provides a summary, looking how a connection to nature brings well-being through emotions and beauty. Before we think about emotion and beauty there is a need to know how the benefits of nature are currently explained. The main models used to explain the well-being benefits of exposure to nature are based upon restoration. Attention Restoration Theory and Stress Recovery Theory help explain how nature restores us. However, nature is also good for us when we’re not feeling run-down. There is also research that suggests the benefits of nature connectedness are not explained by restoration based theories. So, let’s look at two other potential reasons. Firstly, emotions. Being connected with nature is about feeling close to the wider natural world. A relationship that helps us feel good. So emotions could well help explain how nature connectedness is good for well-being. Emotions aren’t just feelings, they are linked to the function of our bodies. Our nervous system, heart and brain. As different emotions come and go, they shape and direct what we do. Regulating emotions is a very important and almost constant function of human life. It helps us respond to and deal with everyday demands in an appropriate way. Research shows that our ability to keep our emotions regulated is important for well-being. In 2016 we studied Japanese research into forest bathing. The results showed that the benefits of being in the forest could be explained in the context of a ‘3 Circle’ model of emotional regulation. Three dimensions of our emotion regulation system are represented by 3 circles. Described below by a falcon for drive. An ash tree for calm. And a wild boar warning for threat. 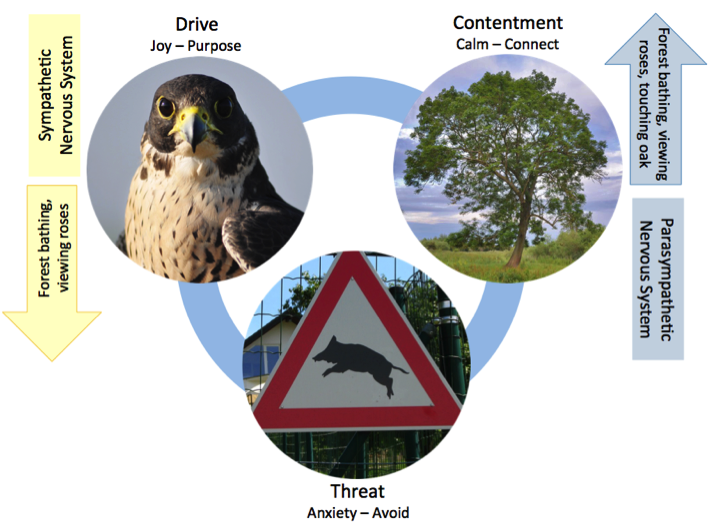 Each day we can experience threat (the boar), drive (the falcon) and contentment (the tree). Each circle brings different feelings such as anxiety (the boar), joy (the falcon), and calm (the tree). Each circle also brings different motivations such as avoid (the boar), pursue (the falcon) and rest (the tree). For wellbeing we need a balance between the three circles. Feeling good and functioning well comes through balancing threat, drive and contentment. Sometimes theses emotions become unbalanced. Perhaps if we’re constantly driven and pressured to do well at work or school, with little time for calm, rest and connection with friends. This can reduce our positive emotions and our threat response can become overactive. We can become anxious when simply receiving an email for example. For these reasons, we proposed that helping regulate emotions could be a way that nature connectedness brings well-being. The second way that nature connectedness could help bring well-being is based on the beauty of nature. Beauty is also a fundamental part of our lives. Our cultural history contains repeated references to nature’s beauty and beauty has been a topic of human thought for millennia. Western philosophy considers beauty as a fundamental aspect of ‘human being’. Recent research has suggested that noticing and engaging with nature’s beauty is key to the well-being benefits of nature connectedness. People who have a deeper response when viewing beauty in nature have better well-being. It has been proposed that noticing natural beauty brings about well-being by promoting a stronger connection with nature. Thinking of our evolution, our senses evolved simply to make sense of the natural world. Beauty comes from easy sensory experiences that flow in. As we’ve evolved and lived within nature for millions of years the sights and sounds of the natural world flow in with ease. The beauty of nature brings pleasure without being useful in itself. As a simple sensory experience beauty is fundamental to our relationship with the wider natural world. The beauty of nature, like emotions, is at the core of nature connectedness. Research shows that appreciating nature’s beauty is key to developing greater connectedness to nature. Finally, research into physiological responses to noticing nature’s beauty match those observed during forest bathing and explained by the three-circle model. Given this evidence, we proposed that noticing nature’s beauty provides a second way for nature connectedness to bring well-being. So we set out to explore the relationship between beauty, emotion regulation, nature connectedness and well-being. We did this using participants in The Wildlife Trusts successful 30 Days Wild campaign. For successive years we’ve found that taking part in 30 Days Wild leads to sustained benefits to well-being. For the third year we included measures of how strongly people respond to nature’s beauty. In a second study we measured people’s ability to regulate their emotions, how easy or difficult they found it to regain control after becoming upset for example. These two studies allowed us answer two questions. One, does noticing nature’s beauty aid the relationship between nature connectedness and well-being? Two, is the relationship between nature connectedness and well-being linked to emotional regulation? 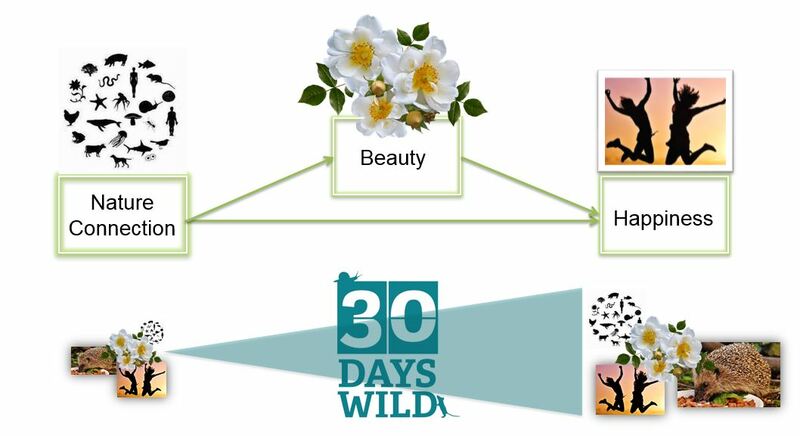 By looking at people’s responses before and after taking part in 30 Days Wild we confirmed for a third time, that including nature in every day life for a month leads to sustained improvements in nature connectedness, well-being and conservation behaviours. People taking part also noticed nature’s beauty more deeply too. A closer look at the numbers showed that noticing beauty helped promote nature connectedness to bring well-being. This confirmed that noticing nature’s beauty is part of the way a connection with nature brings well-being. The three-circle model suggests that appreciating the beauty of nature can calm our more driven emotions, bringing contentment and the emotional balance needed for well-being. Noticing nature’s beauty is key for the well-being benefits of nature connectedness. We then looked at the relationship between nature connectedness, emotional regulation and well-being. This showed that those who found emotional regulation more difficult had a lower connection with nature, and lower happiness. Difficulty in emotional regulation was not associated with noticing nature’s beauty. This suggests that nature connectedness and noticing nature’s beauty, although similar, aren’t one and the same. Some further analysis revealed that emotional regulation helped link nature connectedness and happiness. This is the first evidence linking emotion regulation to the well-being benefits of nature connectedness. The results support our proposal that improving emotional regulation is a way nature connectedness brings about well-being. 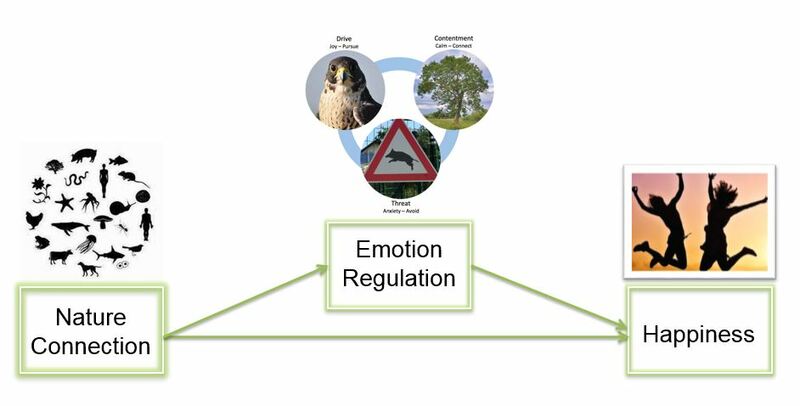 Emotion regulation is key for the well-being benefits of nature connectedness. So both noticing nature’s beauty and emotional regulation play a part in the relationship between nature connection and well-being. Yet, noticing nature’s beauty and emotional regulation weren’t related. This suggests that noticing nature’s beauty and emotional regulation are part of the relationship between nature connectedness and happiness in different ways. So there are two ways nature connectedness can bring well-being. Through aiding emotional regulation, but also through being tuned into nature’s beauty. The research shows that well-being in nature is not just about visiting nature when feeling run-down. To access the wider benefits of nature connectedness, there is a need to feel close to nature and be tuned into its beauty. We evolved to make sense of nature, so let the sights and sounds of nature’s beauty flow in through your eyes and ears.